Bushnell is one of the most popular names in outdoors sporting products, whether you’re talking about riflescopes, rangefinders, or spotting scopes. While many of the company’s products are among the best of the best, does that apply to their spotting scopes, too? On this page, I’ll go over what you can expect from these accessories, and give you a couple of real winners to choose from. First, let’s check out the Bushnell Trophy XLT 20–60x65mm spotting scope. This model offers magnification from 20X to 60X with stunning HD image clarity and excellent eye relief. It includes a hard and a soft case, as well as a tripod. The cases are both outstanding, but the tripod is flimsy and almost useless. Also, the Trophy XLT is rather bulky, and the close focus distance is quite far at 32.8 feet. What Can I Expect From Most Bushnell Spotting Scopes? Most commonly, Bushnell glass will provide you with fantastic color reproduction, without even a hint of chromatic aberration at any magnification. Focus is almost always accomplished with a knob mounted just forward of the “knuckle” between the eyepiece and the maintube, and the control moves smoothly but with just enough resistance to prevent mishaps in focusing on your subject. Finally, all of Bushnell’s optics have standard tripod or Picatinny rail mounts built into the body, so you can place your scope on a tripod or car window mount. Almost every Bushnell spotting scope comes with a soft carrying case, eyepiece and objective lens caps, and a tabletop tripod. Some models also include hard carrying cases. The cases and lens covers are great, but the tripods are almost universally useless. They’re flimsy and don’t include leg levelers, so you can’t really use them on uneven terrain. Save yourself a lot of headache and buy a professional-quality tripod to use with your spotting scope. How Strong Is The Magnification? Bushnell covers a wide range of magnification levels with its catalog of spotting scopes. Some smaller models will zoom from 10X to 42X, others offer from 20X to 60X, and other ranges fall in between. With every Bushnell spotting scope I’ve used, the image clarity, contrast, and crispness (the three C’s) has been outstanding throughout all zoom levels. 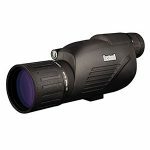 Are Bushnell Spotting Scopes Easy To Use? In terms of the controls being intuitive to find and use, yes. In nearly every case, the zoom level is adjusted by twisting the eyepiece, and focusing is accomplished by turning a knob in front of the scope’s eyepiece. Knurling along the controls is ample enough to allow for use with or without gloves, or with slippery hands, but some models have extremely stiff wheels that make that advantage all but useless. Do These Scopes Offer Good Focus? Throughout all of the scopes’ magnification ranges, focus is outstandingly sharp. Some models have dual controls for independently adjusting the fine and coarse focus of the image, but most are simpler one-knob controls. I’ve never had a problem getting a sharp image quickly enough to catch that elusive rare bird in flight, making these spotting scopes a real pleasure to use. What’s The Optics Quality Like On Bushnell Glass? 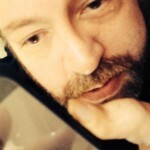 This varies somewhat, but most of the time the optics are fully multicoated. Bushnell occasionally uses ED glass, which provides for an HD-quality image. BaK–4 prism glass is used within Bushnell’s products, and appropriate phase correction coatings are applied to the prisms to prevent phase shift. Do Bushnell Spotting Scopes Have Good Bodies? The chassis on most Bushnell scopes are aluminum, with rubberized armor providing shock absorption. A handful of models, however, use polycarbonate bodies instead. Even in these cases, the housing is easy to hold with one hand and offers some resistance to bumps and falls. 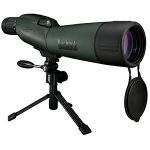 Eyepieces on Bushnell spotting scopes tend to be available as either straight or angled designs, giving you the freedom to purchase a spotting scope that suits your needs. Can I Stargaze With Bushnell Optics? The Legend Ultra HD and Trophy XLT spotting scope lineups are all great for backyard astronomy, but I wouldn’t recommend the other models for that use. With the Legend and Trophy, transmittance is good enough to easily view the surface of the moon, the rings of Saturn, and even some of Jupiter’s Galilean moons. With extensive testing and designs built to last, Bushnell’s scopes are almost universally durable. Most models have rugged, rubber-armored housings that feature nitrogen-purged optics chambers and O-ring sealed lenses. This provides the purchaser with a piece of glass that is shockproof, fogproof, and waterproof. Thanks for reading what I have to say about Bushnell’s spotting scopes. These models are great values, offering terrific sight pictures and rugged longevity. As long as you don’t mind buying your own tripod to get the most out of your spotting scope, you really can’t go wrong with most of Bushnell’s catalog.